None of these activities being well calibrated to earn sympathy in the independent United States that emerged and Pennsylvania hit the lot with a judicial attainder issued by the Supreme Court and ratified by the General Assembly. In a few years’ time the newborn country’s constitution would prohibit acts of attainder but for a few short years this heritage from the mother country — enabling some organ of the state to levy legal penalties on some outlaw party by decree, absent any sort of trial — incongruously continued in that land of the free. In these very pages we have previously noticed an attainder controversially invoked by brand-name founding fathers of Virginia, also against bandits with a pronounced Tory lean. The Legislature were inclined to pass a bill in their favor, and appointed a committee, consisting of Mr. Lewis, Mr. Fitzsimons and Mr. Rittenhouse, to confer with the Supreme Executive Council on the subject of their pardon. This I believe was what proved fatal to these young men. Several of the members of the Council thought the Legislature had no business to interfere, as the power of pardoning, by the Constitution, was given to the Council. They refused to pardon or extend the time fixed for their execution. It was in vain the members of the Legislature and the minority in the Council urged the peculiar situation of these unfortunate men; the majority were jealous of the interference of the Legislature, and it was carried by a very small majority, that they should suffer. Going to the Council the day afterwards, I met them going in a cart to the gallows, followed by their relations and friends. It was a very affecting sight. They died with great firmness. * An island in the Delaware River which was later bisected by a ferry channel, dividing it into Smith’s Island and Windmill Island. Both islands were removed by civil engineers in the late 19th century as an aid to the Philadelphia port. ** To revolutionary patriots, Quakers looked a rather suspiciously British-friendly bunch. 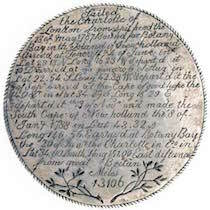 † The body’s president at the time of the Doan hangings was no less than the $100 bill guy himself, Benjamin Franklin. Surprisingly, Benjamin’s son William Franklin had during the war years been the Tory governor of New Jersey in which capacity he had signed off on some political executions of his own. On this date in 1788, Thomas Barrett became the first person legally executed in Great Britain’s Australian colonies when he hanged at Sydney Cove for stealing from government stores. It was barely a month after the First Fleet had arrived from England to found the penal colony. More than just a milestone, Barrett packed an amazing criminal career into the few years he surfaces for us in the documentary record. Our man was condemned to death in 1782 for stealing a silver watch, the first of three death sentences he would hear. That sentence was reprieved in favor of convict transportation, a system which had ground to a halt with the American Revolution and still awaited the creation of the Australian pipeline. In 1783, a convict hulk that had been rejected by the now-independent North American colonies, the Swift, mutinied. Barrett would meet survivors of that mutiny who were stashed away with him on the Censor, one of the earliest of the Thames’ frightful stationary convict hulks where reprieved felons awaited their deportation. In 1784, Barrett and one of the Swift mutineers, Charles Kellan, rebelled once again on their next convict transport ship, the Mercury — earning Barrett his second death sentence, and his second reprieve. Three more years on the fetid hulks ensued while legislators* and cartographers stroked their beards over Britain’s next move in the convict transportation game. And this is when Australia the prison was invented. That First Fleet Barrett arrived on was a flotilla of eleven ships carrying 700 or so prisoners was it, the literal first European colony Down Under. 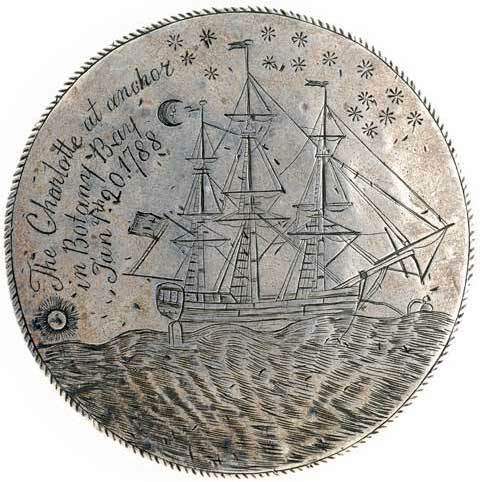 Besides being a man of spirit and enterprise, as his mutiny showed, Barrett was a skilled craftsman who enlivened the tiresome trip around the world by fashioning little metallic mementos. 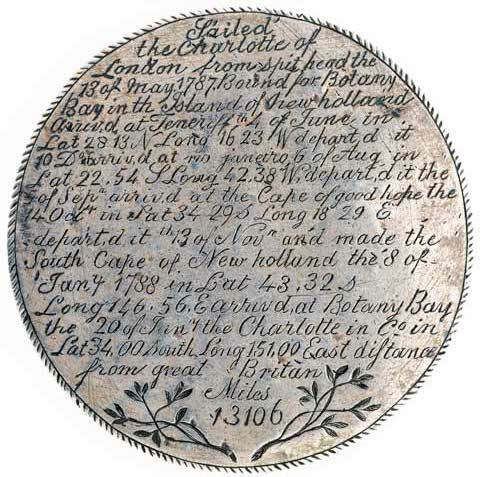 The journal of the ship’s surgeon John White narrates with more admiration than censure an escapade off the coast of Brazil that revealed Barret’s talent for counterfeiting. This morning a boat came alongside, in which were three Portugueze and six slaves; from whom we purchased some oranges, plantains, and bread. In trafficking with these people, we discovered, that one Thomas Barret, a convict, had, with great ingenuity and address, passed some quarter dollars which he, assisted by two others, had coined out of old buckles, buttons belonging to the marines, and pewter spoons, during their passage from Teneriffe. The impression, milling, character, in a word, the whole was so inimitably executed, that had their metal been a little better, the fraud, I am convinced, would have passed undetected. A strict and careful search was made for the apparatus wherewith this was done, but in vain; not the smallest trace or vestige of any thing of the kind was to be found among them. How they managed this business without discovery, or how they could effect it at all, is a matter of inexpressible surprise to me; as they never were suffered to come near a fire; and a centinel was constantly placed over their hatchway, which, one would imagine, rendered it impossible for either fire or fused metal to be conveyed into their apartments. Besides, hardly ten minutes ever elapsed, without an officer of some degree or other going down among them. The adroitness, therefore, with which they must have managed, in order to complete a business that required so complicated a process, gave me a high opinion of their ingenuity, cunning, caution, and address; and I could not help wishing that these qualities had been employed to more laudable purposes. But Barrett’s legitimate artistic career was as brief as it was scintillating. The colony had a tight supply situation and its isolation and heavy convict population seemed to Governor Arthur Phillip to demand the strictest discipline, like that of a ship upon the sea: any significant failure of order could imperil the entire project. He assembled the little colony in early February to impress upon all that stealing rations would be harshly punished. Thomas Barrett, Henry Lovel, and Joseph Hall, were brought before the criminal court, and tried for feloniously and fraudulently taking away from the public store beef and pease, the property of the crown. They were convicted on the clearest evidence; and sentence of death being passed on them, they were, about six o’clock the same evening, taken to the fatal tree; where Barrett was launched into eternity, after having confessed to the Rev. Mr. Johnson who attended him, that he was guilty of the crime, and had long merited the ignominious death which he was about to suffer, and to which he said he had been brought by bad company and evil company. Lovel and Hall were respited until six o’clock the next evening. When that awful hour arrived, they were led to the place of execution, and just as they were on the point of ascending the ladder, the judge advocate arrived with the governor’s pardon, on condition of their being banished to some uninhabited place. As the infant colony had scarcely prioritized establishing an executioner right off the boat, one of Barrett’s fellows was pressed into the disreputable role. Another narrative underscores the tension this incident must have created among the convicts, half-starved and under the lash on the empire’s most distant moon. “The unhappy wretches were conducted wt. a party of Marines walking before them … with a large party of Marines drawn up opposite the Gallows … in case an insurrection should take place … & all the Convicts were summoned to see the deserved end of their Companions.” Hall and Lovel’s pardons should probably be read in this light; Phillip had a job to enforce obedience without triggering rebellion and once he had established the firmest precedent wisely reflected that the quality of mercy blesseth him that gives and him that takes. Two other thieves (of wine, in their case) named Daniel Gordon and John Williams were likewise condemned on the 29th of February only to be spared for banishment instead. 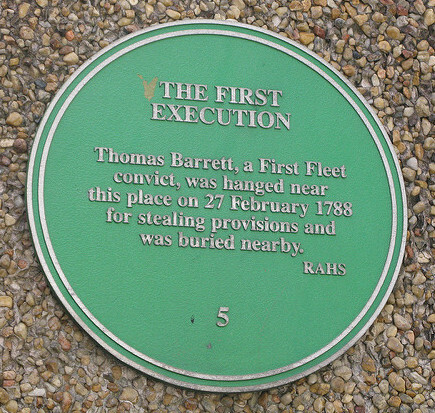 A small marker at Sydney’s Circular Quay commemorates Barrett’s execution. (cc) image by mazzle278. Barrett is an important character in the BBC drama Banished. * The Home Secretary who orchestrated the pivot to Australia was the Viscount Sydney: hence, the Australian city of Sydney. On this date in 1788, John Price Posey was publicly hanged in Richmond, Virginia for arson. He was 35 years old, with two children. Posey, born in 1752, didn’t have the kind of background you would expect for an executed felon. His uncle was the Revolutionary War general Thomas Posey. Posey himself was a childhood playmate of John Parke “Jacky” Custis, stepson of Founding Father George Washington. John Price Posey grew up near the Washingtons’ Mount Vernon plantation and was a frequent guest there. After he completed his education, Washington helped him find a job. When Jacky Custis reached legal age, he appointed Posey as steward of his plantation in New Kent County. All went well for awhile. Posey even became justice of the peace and served in the house of delegates between 1780 and 1781. Posey was back in custody within a day of the arson attacks, and after his arrest, Thomas Green confessed to his role in the affair. Posey was brought to Richmond in chains to stand trial for arson, which was a capital crime at the time. Convicted on October 1, he filed an appeal. On January 18, 1788 the Virginia Court of Appeals voted nine to one to reject his petition for clemency, and told him he must die. The unfortunate and most unhappy John Price Posey begs that a further indulgence of a few days could be allowed him — Hopeful that it would be attended with giving further relief to the peace of mind that your unfortunate petitioner is now in search of. This bought him a week’s stay. On January 25, he was hanged on Richmond’s gallows alongside James M’Connell Fox, a murderer. His body was buried in an unmarked grave, possibly in the Mount Airy area. Virginia law allowed the state to confiscate a person’s property in cases of capital convictions, but in this case, unusually, the Virginia legislature returned everything to Posey’s widow, Anne Kidley Posey. She ultimately remarried. As for his partners-in-crime: Thomas Green was never tried for his role in the arson attacks, and the slaves Sawney and Hercules were ultimately pardoned and given back to their owner, Posey’s brother-in-law. * New Kent County’s archives also held colonial-era records for several other counties. Posey’s spiteful torch wiped out a trove of invaluable colonial-era records and is still lamented by historians and genealogists whose work touches that period as “the greatest loss”. According to a letter later published purporting to be from that Joseph Taylor, however, he and a sympathetic doctor actually engineered one of the most amazing scaffold escapes on record. It all got started when Joseph Taylor found his fellow-condemned Archibald in high spirits one day on death row. I never, even after my condemnation, realized that I was suddenly to die in so awful a manner, until a gentleman, who I afterwards found was a doctor, came and talked privately with the late unhappy sufferer, and my fellow convict, Archibald Taylor, who, when the gentleman was gone, came to me with money in his hand, and so smiling a countenance, that I thought he had received it in charity. But he soon undeceived me, telling me with an air of gaiety, that it was the price of his body. This doctor dropped was doing the workaday ghoulishness of procuring imminent corpses for medical cadavers. This was the first time since my condemnation that I thought what it was to die. The shock was terrible, and Taylor increased it, saying that the doctor had desired him to bargain with me for my body also. The thoughts of my bones not being permitted to remain in the grave in peace, and my body, which my poor mother had so oten caressed and dandled on her knee, and wich had been so pampered by my friends in my better days, being slashed and mangled by the doctors, was too much for me. I had been deaf to the pious exhortations of the priests; but now my conscience was awakened, and hell seemed indeed to yawn for me. What a night of horror was the next night! — When the doctor came in the morning to bargain for my body, I was in a cold sweat; my knees smote together, and my tongue seemed to cleave to the roof of my mouth. And the doctor — remember, he was only there in the first place to get his hands on some raw materials that he could autopsy the day after the hanging — even agreed to receive the “body” in secret from Taylor’s confederates and try to restore it to life. This bit is essential to the narrative, but the skeptical reader can’t help but doubt. What an enormous and unprofitable risk for the unnamed physician to take on behalf of a slab of meat! I want to propose (and this is too delicious to be anything better than baseless speculation) a false-flag operation on behalf of the medical profession, which just days before the Taylors’ hanging had suffered an astounding public relations debacle. Obnoxious Manhattan medical students had wantonly displayed severed limbs from one of their subjects to schoolboys, whose frightened reports of it ultimately set off the “Doctors Mob”. Ordinary people hated and feared anatomization, and resented “resurrection men” who stole corpses (sometimes made corpses) for the industry. The mob smashed up the hospital, thrashed the med students, and made off with the human remains. This is the idiom for Joseph Taylor’s revulsion at being propositioned with the body trade. Although it nevertheless turned out to be his path to salvation, it is evident in his remarks that even then, something in Taylor himself rebels at the coldly utilitarian use to which he himself must put his flesh and bones, and his consequent “reliance on the doctor”, as inimical to the interests of his soul. The state of my mind after my conversation with the doctor, until the day of execution, it is impossible for me to describe. This glimpse of hope, this mere chance of escaping the jaws of death, and of avoiding the eyes of an offended Judge, at whose bar I was no ways prepared to appear, semed to render my mind but more distracted. I sometimes indulged myself with the thoughts of being recovered t life; and as I had fortunately concealed my real name, that I might return, like the Prodigal, to my parents, and live a life devoted to God and their comfort. But I oftener feared the means might fail to bring me to life: and then I wished that this scheme had never been mentioned, as the hopes of life seemed to prevent my conversion; and then, to be surprised into another world, totally unprepared, how terrible! According to the writer, the arrival of execution day wonderfully concentrated the mind on its big plan and put those pesky qualms of conscience to rest. As promised, his buddies got hold of the body and spirited it away to the doctor. After the application of a conveniently unreported treatment, Joseph Taylor quickened back to life two hours and forty-three minutes after he had been “turned off” with the knot at the back of his neck. The reawakening — “I cannot describe the intolerable agony of that moment. Ten thousand stranglings are trifling to it!” — was no more pleasant than the passing had been. Now … is this account true? In the completely unverifiable and also completely sensational version that circulated (quite widely) in periodicals on both sides of the Atlantic, Taylor completed his escape by sailing for the Old World, disappearing thence into obscurity. However, according to another, killjoy newspaper (Western Star, Feb. 2, 1790) some early-American Mythbusters team got wind of this popular fable and went to dig up Joe Taylor’s alleged grave — finding the highwayman securely taking his dirt nap after all. That may be so, but the reader will kindly observe that two-plus centuries on, nobody’s posting anything about Archibald Taylor. * No relation between the two Taylors, to judge by the indifferent way Joseph writes about Archibald. On this date in 1788, the real-life Dr. Jekyll and Mr. Hyde was hanged at Edinburgh. The Execution of Deacon Brodie, by Alexander Hay Ritchie. William Brodie, respectable burgher by day, Deacon of the Guild of Wrights, wasn’t the type for the gallows. Actually, the upright citizen is said to have proposed an improvement in the old Tolbooth gallows, replacing the old-school ladders with a forward-thinking drop mechanism. Insouciance in the face of mortality … but Brodie had plenty of practice in compartmentalization. With a gambling habit, a couple of mistresses, and five kids, Brodie the oleaginous society man had a double life, or treble, or more. 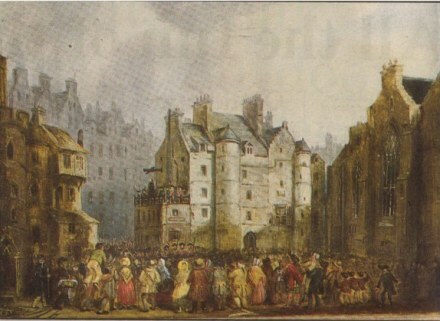 By and by, the well-known tendency of such profligate pastimes to lead a man to venture his neck in order to keep up appearances worked its will upon Brodie, who began using his contracts with Edinburgh’s upper crust to case their houses and copy their keys … returning at night to burgle his employers. It was taking on partners that did in the budding master thief; inevitably, someone flipped to dodge the gallows himself. Brodie’s cover was blown, and he hanged with his confederate George Smith, keeping up appearances to the very end. A century later, native Edinburgher Robert Louis Stevenson would tap this extraordinary local history (and maybe some similar predecessors) as inspiration for that classic novelistic exploration of the soul’s duality, The Strange Case of Dr. Jekyll and Mr. Hyde. In fact, prior to that work’s 1886 publication, Stevenson (who grew up with Brodie furniture in the house) co-wrote a play called Deacon Brodie, or The Double Life. That earlier composition hasn’t been entrusted to celluloid, to my knowledge (though there is a Deacon Brodie film of recent vintage). But Jekyll and Hyde has been. 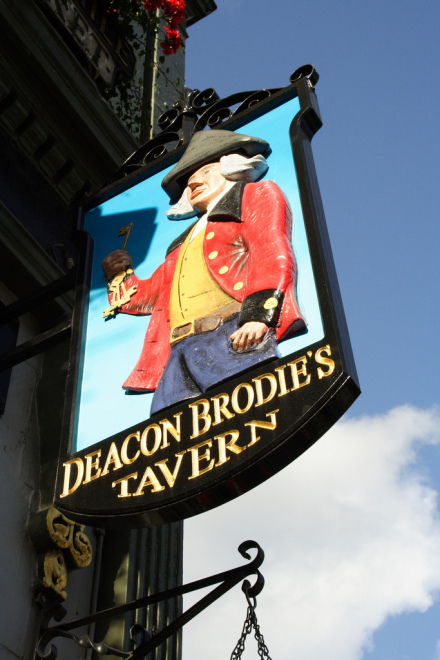 Brodie’s striking case does not live on only through his literary doppleganger(s); you can enjoy the company of the hanged criminal to this day on Edinburgh’s Royal Mile at Deacon Brodie’s Tavern. Brodie himself is supposed to have made his own bid to live on by surviving the hanging. William Roughead in Classic Crimes describes these machinations whose generally attested failure is now and again disputed anew. Of the many picturesque legends of old Edinburgh which, in defiance of truth, cling like ivy about her vanished past, one of the most persistent is that Deacon Brodie was the first to suffer upon the new drop which he himself designed. This myth, upon research, I found myself reluctantly compelled to disprove. He may have planned the “moveable platform for the execution of criminals,” which the Town Council caused to be erected in 1786 at the west end of the Tolbooth; but it was certainly not of his construction, nor was he the first to benefit by its ingenuity. The place of execution was the roof of a low building which projected from the west gable of the prison — roughly where the Buccleuch statue now stands. A beam was drawn out from an aperture in the wall above the platform and from this depended the fatal rope.